Synopsis: A trio of friends go on a search for gold in the woods where a famous UFO sighting happened. As night falls, they begin to face an alien presence. With as saturated as the found footage genre is nowadays, a film really has to try and do something unique and different to stand above the rest. But when you have a trio of young adults getting lost in the woods as your main catalyst, it's tough to create something fresh and interesting. HANGAR 10 is another found footage entry where three friends go out into the woods (15 years after BLAIR WITCH spurred this genre), but this time they're searching for treasure with metal detectors, and creepy things start going bump in the night. Of course they're filming everything so they can throw their adventures on YouTube, and they just happen to be exploring an area that had an infamous UFO encounter from 33 years prior. You can probably guess where this plot is going. The trio starts to bicker and fight, then their car disappears, and strange sounds and lights seem to follow them. Unfortunately, the first half of the film severely drags. The pace is not conducive for a horror film. It's not even a "slow burn" where the plot is building characters and conflict. The characters feel listless, and the only lasting impression they have is them fighting with each other. It just feels slow and tedious. Once the aliens start messing with the protagonists, the film picks up slightly. Director Daniel Simpson creates a couple of tense and eerie moments in the second half. And he makes great use of the darkness and loneliness of the woods and the creepy sounds you hear. It's tough to evaluate the jump scares because viewing this on a computer screen takes away from the experience of being immersed in the film. But what saves the film a bit are the visuals. When you're using a found footage style, special effects are even more impressive because they feel a bit more real. There are two money shots which are stunning, but by the time those happen, it's tough to be invested. 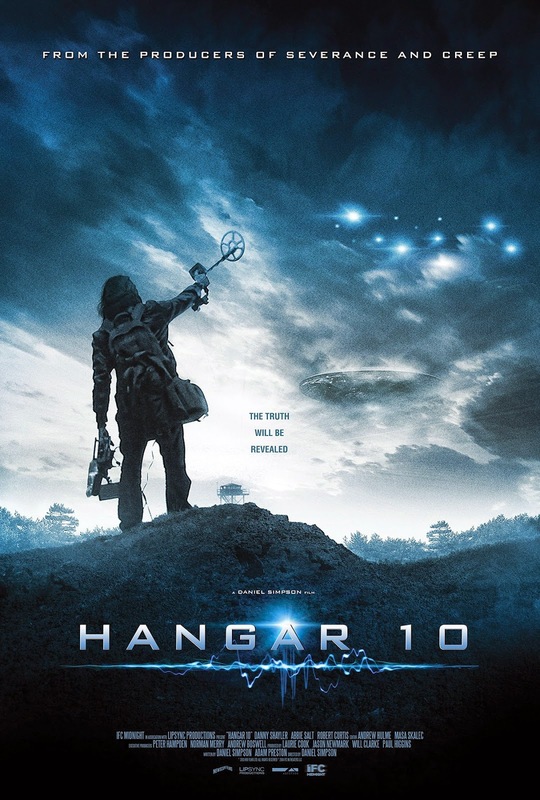 Though it's not a bad entry in the found film genre, HANGAR 10 fails to make any lasting impressions. With better characters and better pacing, this could have been a fun film to watch, but in the end, it just felt tiresome.